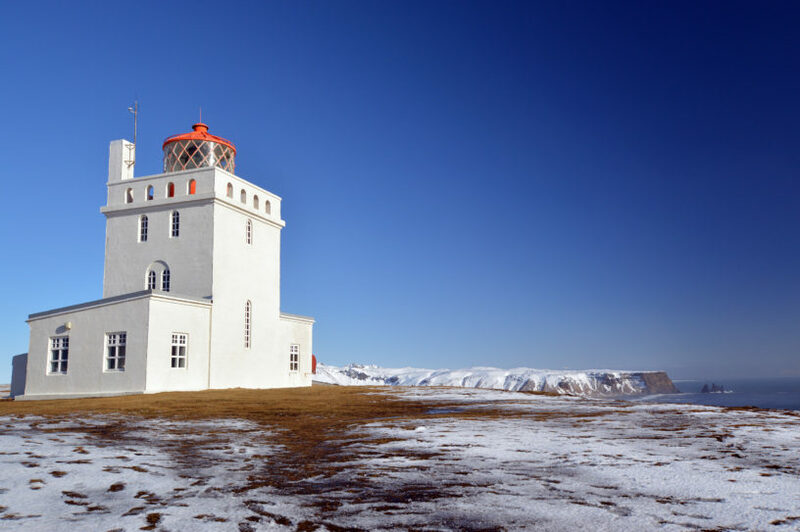 Even if you are visiting Iceland for just a few days with Reykjavik as your base, you can take several day trips to enjoy its natural scenery and rural attractions. One such trip is a drive along the south coast to the village of Vik. VIt is also best to plan this trip for a week day in the summer, and Monday-Thursday in the winter, due to pool schedules. Vik is nearly 3 hours away by car, and there are several points of interest along the way, so I suggest you leave early, 8 a.m. in the winter, and even earlier in the summer if you can. Bring a lunch, snacks, water, and even a thermos of tea or coffee to save time and money. There won’t be many opportunities for food during the day, and time will be precious. Hiking boots are a good idea, especially in the summer. Also bring a bathing suit, a towel and a change of clean underwear – you will be ending your day with a swim! Whether traveling in winter of summer, I recommend you drive directly to Vik and then make your way back and visit sites in reverse order. This will allow you to avoid the bulk of the tourists in some locations and makes for the best light in others. In the summer there are two more things you can do here. You can drive up to the tiny Vik church, which is surrounded by purple lupins in the summer and provides a good vantage point for a view over the village. 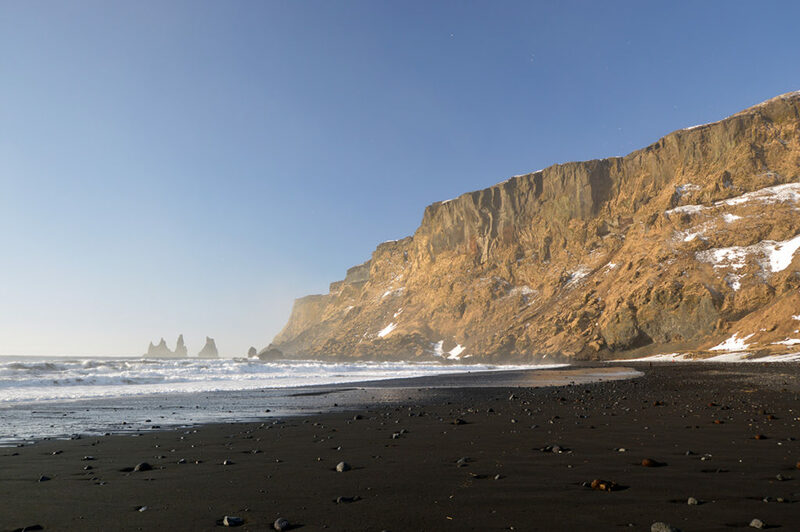 If you have time and are feeling energized, you can also hike the cliffs overlooking Reynisdrangar, the famous sea stacks resembling a three-mast ship. The start of the trail is at the entrance to the village and has a trailhead sign with a map and a small dirt parking lot. The hike beings with switchbacks up the hill side and then is mostly flat all the way to the cliffs. The trail will take you through sheep pastures and moist, dense fog until you descend and come out on a green velvet ledge overlooking the petrified troll ship and many sea birds in their nests. Depending on your speed, this hike will take 1-2 hours, so if you’re feeling hungry, this is an amazing spot for lunch. Once you’ve visited Vik, you can begin to make your way back towards Reykjavik on the Ring Road. 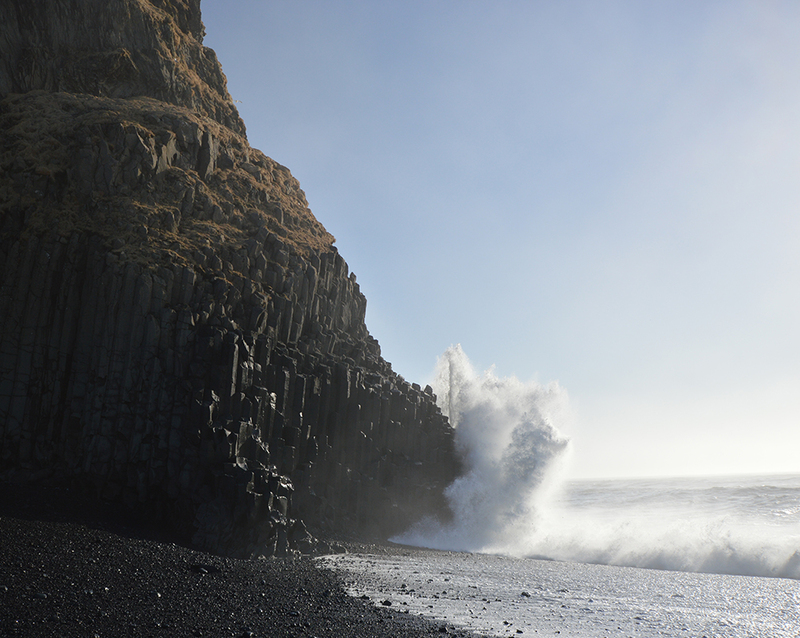 Your next stop is only 10 minutes away – look for signs for Reynisfjara Beach. You will turn left off the main road and drive for a few minutes towards a sizable parking lot. There is now a restaurant here as well. Reynisfjara possess the famous basalt cave that you have probably seen in many photos of Iceland. Depending on the tide, you can walk back behind the cave along the beach, or only gaze from the front upon the inscrutable creation of molten lava that is this stone temple as waves crash in deafening foamy explosions against the black wall. I do not recommend going too close or inside the cave – rocks are continuously falling off the cliff. I personally witnessed a woman nearly getting hit in the head with a falling rock as she posed for a photo. Climbing on the basalt columns bakes for a much better photo, provided the surf is not too close to wash you away! Your next destination is Dyrhólaey, the next cliff on a promontory. There you will find a bird sanctuary, a dramatic rock arch, and an unusual gleaming white lighthouse. It is possible to walk over there from Reynisfjara, but I don’t recommend it as the tide and surf can change the accessibility, and you can end up stranded. Instead, drive back out to the Ring Road and head a few more miles back towards Reykjavik, until you see a sign for Dyrhólaey. This road towards the coast will take you past a few farms and eventually to a thin strip over water (or ice), followed by a steep ascent. This may seem scary, but don’t be intimidated, just keep your eyes on the road and don’t slow down before going up. Even in winter this little drive is completely doable even with a small sedan. When you come to a fork in the road, stay to the left to arrive at the “lower” parking lot. Here you will find an overlook over the stone arch, as well as the beginning of a path going to the right and up hill. Unless there is a lot of snow, you can hike to the lighthouse from here. It takes only about half an hour, and it’s easy to follow a rope barrier along the cliffs. After you’ve enjoyed the serene views from the lighthouse, make your way back to your car. 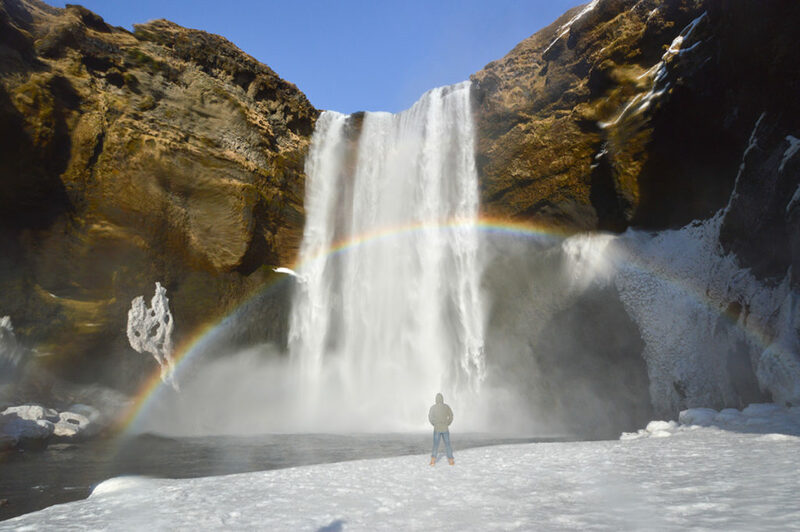 It’s a 30 minute drive to Skógafoss – remember, you are still heading back towards Reykjavik on the Ring Road. You will see the tall waterfall from the road, and now you can admire it in the afternoon sun, with permanent rainbows hanging above it. This is where you ask yourself – is this real? Or is this some kind of elaborate Disneyland? In the summer Skogafoss is framed with deep green lawns, and usually a couple of brave sheep peacefully feeding as tourists snap pictures. In the winter, you will have to skate across ice to approach it. Protect your camera equipment here – the spray is constant. The waterfall is not the only attraction here – in the same area, just to the right, is the most extensive ethnographic museum in Iceland. Skógar Museum is open until 6 p.m. in the summer and until 5 p.m. in the winter. Plan your day to have at least 45 minutes to spend here, and more for the gift shop, which is one of the best as well. This fascinating collection of objects and buildings is the life’s work of Þórður Tómasson and a true testament to perseverance in preservation. Þórður started the collection as a young man and curated the museum for over 60 years. You can learn so much about the unique Icelandic life by seeing the real objects that surrounded people – bone skates, numerous knitting needles, ram condom, frog amulets, mittens, boats, coffee pots, and old copies of the sagas. 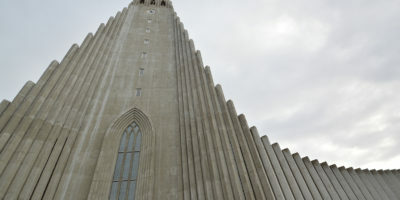 This is what Iceland is so good at – keeping the past alive today. The museum marks the end to your day’s site seeing. Although your day is not over, everything going forward is pure pleasure and reward for all the driving and hiking you’ve done. You can now head back on the Ring Road, but instead of going back to Reykjavik, you should stop in Hveragerði, about an hour and a half from Skogafoss. Hveragerði is a town known for its hot springs and unique geothermal greenhouses. 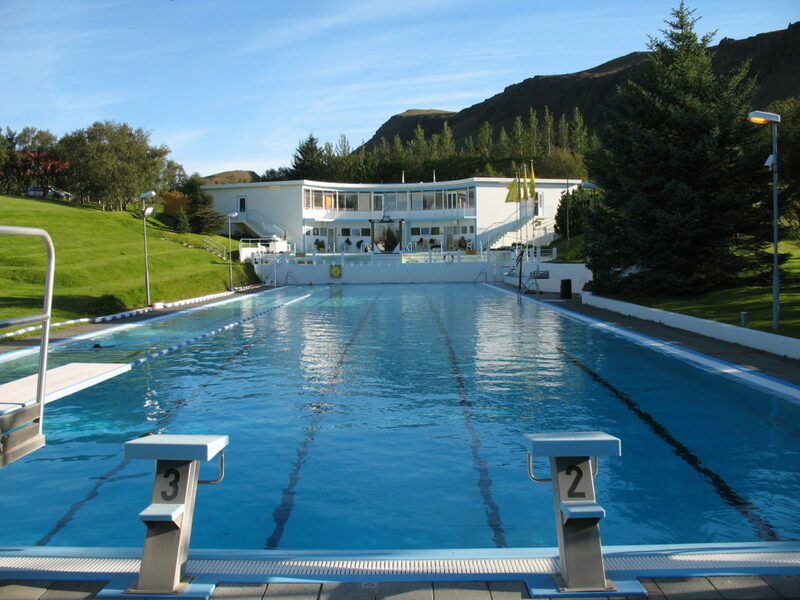 But few people know that it also has one of the best swimming pools in Iceland. 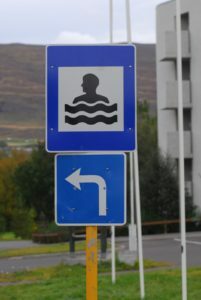 When you reach the Hveragerði roundabout, turn right towards the town and proceed until nearly the very end and turn right again when you see a road sign indicating a pool. Sundlaugin Laugaskarði has one of the longest lap pools in Iceland, an elegant white art-deco building, a view, possibly the hottest steam room in Iceland, and one of the best cold dips of all the pools I’ve visited. 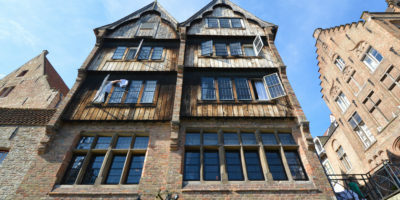 It is also visited almost exclusively by locals. Remember to leave your boots in the lobby and to shower thoroughly before entering the pool. In the summer, it is open until 8:15 p.m. Mon-Fri, and until 6:45 p.m. Sat-Sun. In the winter (which is mid August – mid May), it closes at 5:15 p.m. on Friday, Saturday, and Sunday. I advise you to take take this into account and plan this trip on a week day, so that you have a chance to visit this wonderful place. Try to get here by 6:30 p.m. to have plenty of time to do some laps in the heated pool and enjoy the steam and some conversation in the hot tubs. When checking hours for any pool in Iceland, it is always best to check the Icelandic language website. You might have to translate the days of the week, but I’ve found that the hours are more up to date. Fjorubordid Restaurant. The specialty here is small lobsters, and the menu has not changed for years – it is world famous. Officially the restaurant closes at 9 p.m., but as long as you get here before 9, they will feed you. It is usually still completely packed and serves well past closing. Lobsters come with potatoes, cous cous, and salad, and the pre-fixe menu includes soup and dessert (both great). For vegetarians, there is an entree (usually something with egg) that comes with all the same sides. The food is great, and after the day you’ve had, it will seem like the best meal of your life. The safest way to get back to Reykjavik is to go back to Selfoss the way you came and turn left on Ring Road (Route 1) towards Reykjavik. If it’s summer, and you still have daylight, you can take an alternative way on Route 39 towards the Ring Road.